I’ll have this scarf done just in time for winter! This squirrel I saw at the park last month was playing with a stick that was snapped in half. Maybe he was divining for water? Getting ready to go cross country skiing? Was making a set of crutches for an injured comrade? Perhaps, but maybe he was using those sticks as knitting needles and was making something warm and cozy for the upcoming cold winter. If even an untrained squirrel can weave together an intricate nest out of nothing but sticks and leaves, then certainly they could rock a killer crochet project, right? We know what this week’s Saturday Squirrel’s friends and family will be getting for Christmas… and there’ll be no receipt to take it back either! 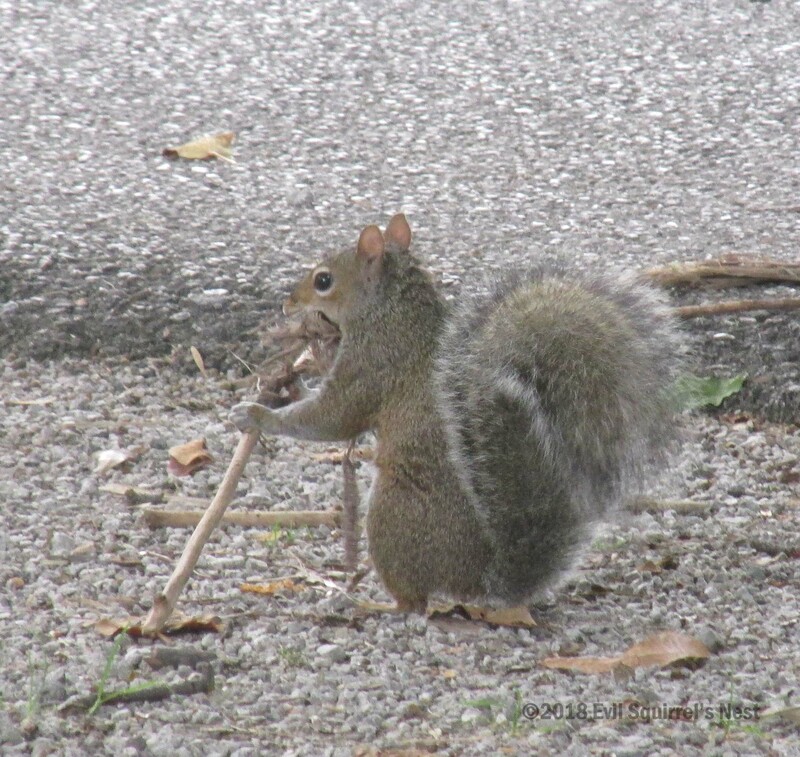 This entry was posted in Saturday Squirrel and tagged adorable, cute, knitting, photo, photography, squirrel, stick, sticks. Bookmark the permalink. I could totally see that little guy whipping up a neck scarf! Getting ready to ski down the slopes. I’ll bet squirrels could ski down a bare tree in the winter…. It looks to me like he’s on a long hike and he’s just stopped to take in the view. I think he’s building a cabin……..! The Abe Lincoln of squirrels! If he’s anything like my dogs who are VERY into chewing on wood (you should see what’s left of our coffee table! ), he’s just picking his teeth. Is he knitting a pink hat?